I am a language education consultant with over 35 years of experience. For many years I was a senior lecturer in TESOL at a British university, but I now undertake a variety of tasks both within and beyond academic institutions. I offer a range of language education consultancy services. Please do contact me to put out feelers about working together. I have an extensive publication record and I am a regular presenter at international conferences usually as a keynote or plenary speaker. I travel widely and have been fortunate enough to deliver numerous presentations, consultancies, guest lectures and workshops in over 20 countries. I have worked with a number of institutions across the globe to gather data for research. My expertise includes: education technology; methodology; syllabus design; teaching materials; research methods; English for Academic Purposes (EAP) - most recently (and for obvious reasons) I have become particularly interested in social media for continuing professional development (CPD) in TESOL. I base myself in the UK for much of the year and in Thailand for the rest. Having two hubs sometimes allows me to undertake regional-based activity at a fraction of the cost as long haul flights can be avoided. I am a reader for the following of peer-reviewed journals: TESL-EJ, TESOL Journal and System. I have had commissions from Routledge and Oxford University Press to review works prior to publication. Additionally, I have extensive experience of external validation and examining at undergraduate, MA and PhD levels. I have also undertaken work to promote: a digital innovation British Council ELTONS award winner; an MA course; three international language education conferences; several book publications - all via this website and its huge social media outreach. Jarvis, H. (2017) ‘TESOLacademic.org - our ever changing story.’ ELT Research. Vol. 31. pp. 39-41. Jarvis, H. (2015). 'From PPP and CALL/MALL to a Praxis of Task-based Teaching and Mobile Assisted Language Use.' TESL-EJ. Vol. 19. No. 1. pp. 1-9. Jarvis, H. (2013). ‘Computers and learner autonomy: trends and issues.’ In S.Sheehan, (ed), British Council ELT Research Papers Volume 1. London: The British Council. pp. 387-409. (download the whole volume). Jarvis, H. and Achilleos, M. (2013). 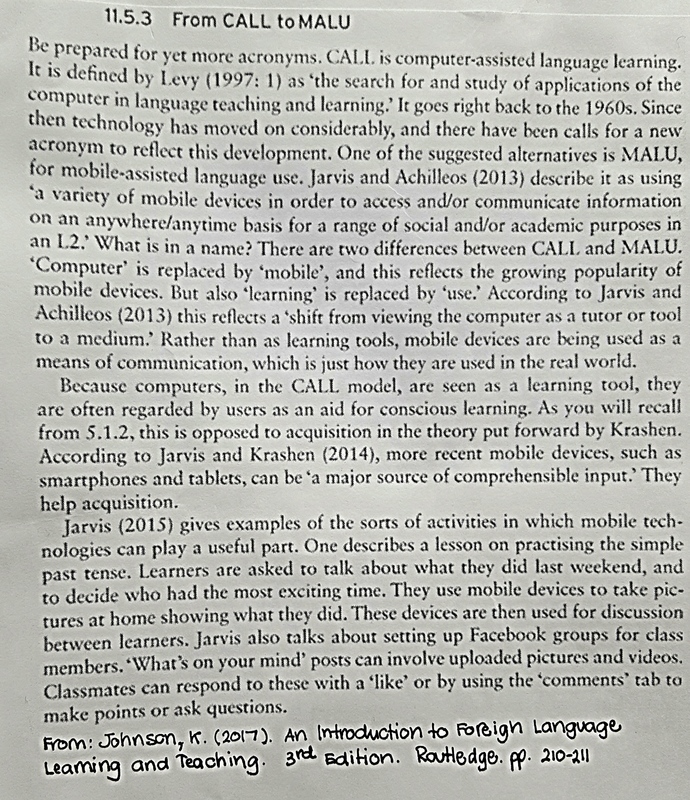 ‘From computer assisted language learning (CALL) to mobile assisted language use.’ TESL-EJ. Vol. 16. No.4. pp. 1-18. Jarvis, H. and Szymczyk, M. (2010). ‘Student views on learning grammar with web and book-based materials’. English Language Teaching Journal. Vol. 64. No.1. pp. 32-44. Jarvis, H. (2008). ‘Computers and independent study: practices and perceptions of students’. In P. Torres and R. Marriot, (eds), Handbook of Research on E-Learning Methodologies for Language Acquisition. PA: Information Science Reference. pp. 367-386. Figura, K., and Jarvis, H. (2007). ‘Computer-based materials: a study of learner autonomy and strategies’. System. Vol. 35. No. 4. pp. 448-468. Jarvis, H. (2006). ‘Issues of computer-mediated communication for English Language Teaching’. British Journal of Education Technology. Vol. 37. No. 4. pp. 643-645. Jarvis, H. and Atsilarat, S. (2004). ‘Shifting paradigms: from a communicative to a context-based approach’. Asian EFL Journal. Vol.6, No.4. Jarvis, H. (2004). ‘Investigating the classroom applications of computers on EFL courses at Higher Education Institutions’. Journal of English for Academic Purposes. Vol. 3, No.2. pp.111-137. Jarvis, H. (2001). ‘Internet usage of English for Academic Purposes courses’. ReCall. Vol.13, No.2. pp. 206-212. Jarvis, H. (1997). 'Word-processing and writing skills: practical applications to language teaching text books’. British Journal of Education Technology. Vol.28, No.3. pp. 165-175. Google Scholar sats. for November, 2018. Mann, S., Davidson, A., Davis, M., Gakonga, J., Gamero, M., Harrison, T., Penny Mosavian, P. and Richards, L. (2019). Video in Language Teacher Education. ELT Research Papers. 19-01. London, The British Council. Kukulska-Hulme, A. (2018). Mobile-assisted language learning [Revised and updated version]. In: Chapelle, C. Ed. The Concise Encyclopedia of Applied Linguistics. Wiley. Jones, C. (2018). Conclusion: Implications for pedagogy and research. In Jones, C. Ed. Practice in Second Language Learning. Cambridge: Cambridge University Press. pp. 254-264. Johnson, K. (2017). An Introduction to Foreign Language Learning and Teaching. 3rd Edition. Routledge. pp. 210-211. ‘Help teachers resolve problems in the classroom, Dubai conference told.’ The National, UAE. (March, 2014). 'What’s the best way to teach languages?’ The Guardian Teacher Network, (June, 2013). ‘The internet generation’s clear Call for knowledge.’ EL Gazette, (April, 2011). February, 2019. A Liverpool University supported webinar on 'The what, why and how of Mobile Assisted Language Use'. Link to recording. .............................................................................................................................August, 2018. Mini-conference on (In)Formal Second Language Learning: Integrating Informal Practices into Formal Contexts. Keynote speaker, Dept. of Education, Oxford University. Supported by The British Association of Applied Linguistics. 'Technology and informal learning: listening to the voices of our students'. May, 2018. Workshop ‘Education technology in traditional “presentation practice production” lessons and task-based alternatives. University of Graz, Austria. November, 2017. Guest workshops on ‘Communicative Language Teaching (CLT): basic ideas’. National University of Laos and Lao-German Technical College. June, 2017. International Language Symposium, organised by CA Institute of Languages, Brno, Czech Republic. Plenary Speaker ‘From digital self and students, to professional self and teachers’. March, 2017. IATEFL Slovenia. Plenary Speaker ‘I link therefore I am: ideas and issues for CPD in an online environment’. February, 2017. Cambodia TESOL. Featured Speaker. ‘Building TESOL communities: from face-to-face to online’. January 2017. 'The communications revolution: implications for humanities education ' and 'Digital residence in English as an L2: What does this mean and why does it matter?' Thammasat University, Bangkok. Interview about my IATEFL 2017 presentation "I link therefore I am: why does it matter". Webinar from The British Council Teaching for Success Online Conference, October 2016. 'Online TESOL resources and networks for CPD: towards more active teacher engagement.' (You will need to sign in as a guest to Adobe connect to watch this 1/2 recorded talk, together with accompanying chat). Blog Technology in PPP and Task-Based Language Teaching Lessons for the IATEFL Learning Technologies Special Interest Group. TESOL, Greece, (2016). Summary blog of Digital ELT Ireland 2015 conference, including my plenary talk by Helen Legge.